[Keystone Oktoberfest. 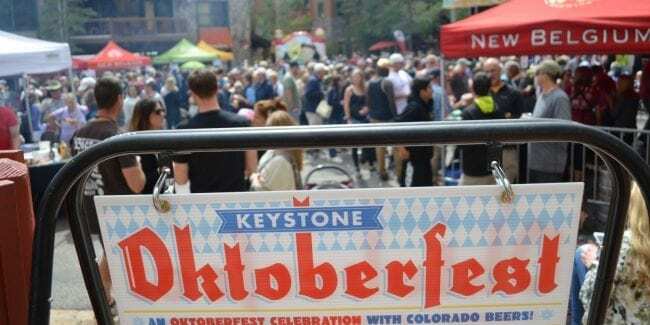 Photo: keystoneneighbourhood.com] Since 2012, Keystone has hosted it’s annual Oktoberfest in River Run Village, a celebration of Colorado beer in Bavarian fashion. The 8th year brings more speciality New Belgium-brewed Oktoberfest beers, so bring your drinking hat. This year’s festival takes places on Saturday, August 31st, 2019 at the base of Keystone Resort. Indulge in authentic German fare including plenty of delicious bratwursts. Listen to traditional music and dance by the Edelweiss Schuhplattlers. Bring the kids to this family fun event for activities like free face painting, chicken dancing and a bounce house. If you’re feeling fit, join in at noon for Das Bier Burner 5K. All finishers receive a cold pint of German-inspired craft beer. The village shops will be hosting an Oktoberfest Tent Sale, so you can bring back a unique Colorado gift.